Maybe I was a little more nervous than usual – not wanting to get hurt or killed on the last day of the “war”. We were at General Quarters; my battle station for two years had been projectile man in Gun Mount 051. I have forgotten who the other six crewmembers were at the time, but “Squinty” was the Mount Captain, and Forrest Daniels (GM3, Beverly, WV), was the gun captain. The mount captain stood on a little shelf at the back with his head protruding through a hatch in the top of the mount and was an overall authority. We were doing automatic rapid fire at a sleeve pulled behind an airplane. We had already fired several rounds in one or two previous passes and were well into the third when “it” happened. 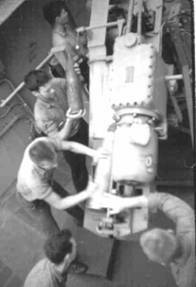 The powderman and I were placing rounds into the tray lickety split with me tripping the lever to ram the charge home into the breech. The breech block came up vertically and locked, if we were in “Automatic,” the gun fired simultaneously. As it fired and recoiled, the brass from the powder charge would be expelled. While that was happening I was already taking another 54 pound projectile from the elevator – only this time my rhythm was broken, the gun didn’t fire. I looked into the tray, the breech block was two-thirds closed and the back one third of the brass powder charge exposed. As I looked at it, I'm thinking: “This is not good, the firing pin is still cocked and armed, what if it struck the powder case? We’ll all be broiled.” In short, I panicked and headed for the exit hatch. Then I heard: “SILENCE! Silence in the gun mount! Bledsoe, where the hell do you think you are going? Get back to your station!” Then “Squinty” came down from his perch and he and Daniels methodically and calmly worked the breech block back into position. I don’t recall that we fired anymore that day. I do remember that thereafter I was perfectly calm, but the embarrassment was unbearable. As far as I know, nothing else was ever said about the incident although I’m sure it didn’t enhance my reputation any, but by that time it was pretty well shot anyway. So I say to John J. Mund, Gunners Mate First Class, from Elco, IL, wherever you are, my hat’s off to you. And from the 50-year perspective I can see with the fog and immaturity of youth long since stripped away what a great honor it was to be able to serve with you and the other WWII veteran petty officers and officers of your caliber. 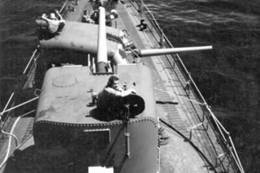 starboard with Gun Captain in hatch. Mount O52 Gun Captain on standby. case in the tray and the 54 lb. projectile being lifted in place.